The truth is that planning for long-term growth will make the first skatepark easier, not harder. A single skatepark will be expected to provide long-term value. With a long-term skatepark development plan, the advocate presents their vision once for (potentially) several facilities, then focuses their advocacy efforts on “phase 1” of that larger plan. When that first skatepark is finished, the advocate can turn their attention to the next facility, or leave it for the next generation of skaters. Either way, the plan is in place and hopefully is recognized by the community as something they plan on supporting in the future. The long-term plan saves time by preparing community acceptance for ALL of the future parks, not just the immediate one. Future advocates don’t need to present the idea of a skatepark from scratch; they can just point to the plan and start their effort within that framework. An additional value to community-wide planning is that the advocate can demonstrate the entirety of the need. Consider that fire departments don’t build fire stations next to the burning house; they put fire stations where they will best serve the community. Skateparks should be treated similarly. Plan for the whole community, then develop the first park to meet the immediate need. Developing this plan is easy and will provide your advocacy effort with a fundamental logic that few skatepark detractors will have an answer for. The skatepark adoption model (or SAM) is a formula for calculating how much skatepark your community needs. It does not dictate what that skatepark, or skateparks, look like, or how big they are, or where they go. It only produces a total amount of space required by your local skaters. It’s the starting point for talking about where those parks go, how large they are, and so on. Tip: If you don’t enjoy crunching numbers and aren’t interested in developing a thorough data dashboard for your community, you can skip this entire process by aiming for one 10,000 square foot skatepark for every 25,000 residents in your town. Essentially, that’s a skatepark in every neighborhood (or thereabouts). One 10,000-square-foot skatepark for every 25,000 residents. The full skatepark adoption model has the following steps. A service area is—in its simplest terms—the neighborhood around the skatepark that will directly benefit from its existence. The service area excludes tourist skateboarders and individuals that are traveling greater distances to skate there. Small skateparks have small service areas, and large skateparks have large service areas. To begin, you’ll need to find out how many people live in your community that you want to serve with the skatepark, (or skateparks). If you’re like most people, you’ll be promoting a skatepark to serve the needs of your entire town or city. However, in large cities and metropolitan areas composed of several cities clustered together, the service area might be a simple neighborhood. In rural areas that service area might be an entire county. The advocate determines what that service area is and there are some advantages and disadvantages to service areas of different sizes. The skatepark adoption model is simple and easy to adjust for different sizes of communities. It’s best to start with your entire town or city (or county if you live in an unincorporated area). After you see the results, you can decide if you’d like to focus on a larger or smaller service area. You can go back and revise your plan at any point. We encourage it! For our example, we’ll use Smallville, a fictional town in the middle of nowhere. Our group decides that our skatepark proposal will serve the entire town and not just a neighborhood within it. Our service area for Smallville is basically its city limits. Later, if we decide that is too ambitious, we can focus on one of Smallville’s neighborhoods instead. You need to know how many people live within the service area. The number of people will indicate how many people need (and will use) the skatepark. This should be easy if you’re using an uncomplicated border, like city limits. If you’re using a more difficult boundary, like a neighborhood or region, you may need to spend more time getting the data you need. The US Census should be able to provide most of the information you need. The first few times you visit the Census site it can be overwhelming, but getting to the data you need is easier than it looks. If your community is outside of the United States, consult the appropriate agency’s website to determine your local population. You should see a list of statistics about your state in the first column and nationally in the second column. You will be coming back to this page from time to time as you prepare your advocacy materials. It’s very useful. Along the top of the page, find your county and/or city in the pull-down menus and hit the Go button. You should see a list of statistics about your county or city in the first column and the state in the second column. This is useful for understanding in what ways your area is like the state average and where it’s different. You will find ways to use these statistics throughout your advocacy effort. The first line should read “Population estimate” with the newest year that is available. Write this number down. You will be referring to it a lot. NOTE: If you live in a town with fewer than 5,000 people, it won’t appear on this list. Very small towns are special situations that can skip this step. We’ve looked up Smallville and found out that the population is 100,000 people. Multiply the population of your service area by .03 to determine what percentage of that population are casual skateboarders. Like your local population, the number of local skateboarders is going to be a number that you use quite a bit. The logic behind the “.03” factor goes like this. In 2009 there were 9,281,500 casual skateboarders in the United States. In 2009 there were 305,000,000 people in the United States. 3% of people living in the United States had stepped on a skateboard at least once in the past year. This isn’t to say that all of these casual skateboarders would benefit from a skatepark. Most of these people step on a board every now and then and push around the neighborhood, or they ride a longboard to school, and so on. They aren’t all “trick skaters” that are currently frequently skating in places where they’re not allowed. Let’s look at our fictional town of Smallville again. We determined in Step 2 that there were 100,000 residents in Smallville, and now we know that 3,000 of Smallville’s residents are casual skateboarders. Market research studies reveal that in 2009, 27.9% (or .279) of all skateboarders skated on average once a week. These are “core skaters” and are the type of skaters you might see doing tricks around town. Core skaters are the ones that will be immediately drawn to the new skatepark. All the rest of the skaters can be considered “casual” skaters. They ride longboards or cruisers but may not be immediately attracted to the skatepark. It’s easy to find out how many core skaters there are in your service area. Simple, right? Now you know the population of your service area, the number of casual skaters, AND the number of core skaters. You probably know now more about your community’s skate scene than anyone else. In Smallville, we can take the number of casual skateboarders and multiply by .279 to find out how many core skaters are in town. So, 3,000 casual skaters times .279 equals 837. There are 837 core skaters in Smallville. Terrific! SHORTCUT: There’s a faster way to calculate the core skaters in your service area directly from the general population. The quick way is to multiply your population by .00837. However, if you do this you skip the number of casual skaters, and that can be very useful in certain situations. We recommend calculating only the core skaters from a general population if you need a quick assessment of a particular area. For full-strength advocacy, calculate for casual skaters and core skaters. All of the core skaters in your service area aren’t going to skate at exactly the same time. You don’t need terrain for someone that isn’t skating; you only need enough terrain for the maximum number of people that are likely to be skating during the most active times. “Rush hour” at the skatepark is Saturday at 4:00 PM, (weather permitting)… so the skatepark needs to be large enough to safely accommodate all of the skaters in town that will be using the facility at that peak time. Here’s another way of looking at it. If you need to carry up to a gallon of water from one place to another in one trip, your bucket needs to hold a gallon of water. Sometimes you will be carrying less than a gallon of water, but your gallon-sized bucket is still the right tool for the job. Carrying around a 5-gallon bucket is a waste of bucket, and carrying a tiny bucket will end up spilling water all over the street. Your skatepark should be the right size for the maximum simultaneous number of skaters in your community. We estimate that one-third of all core skaters in any particular area are the maximum number of skaters that will use the local skatepark or skateparks at once. This will usually occur between the end of the school day and 6 o’clock (or thereabouts), then again on weekend afternoons, weather permitting. While this number is not an exact figure (it’s probably more like 20%), it takes into account other skatepark users such as BMX riders, scooter riders, and the occasional casual or beginning skateboarder. The peak load is the maximum number of skaters that would use the skatepark at once. It should not be confused with the total number of skaters that would use the skatepark in total. If the amount of skateparks in an area aren’t large enough to accommodate all of the skaters during peak load times, some skaters will be displaced and return to the streets in search of a place to skate. In other words, they’ll take a look at the crowded skatepark and decide to hit their favorite street spots. SHORTCUT: Just like determining the number of core skaters in the service area directly from the general population, you can determine the peak load directly from the general population, though we advise against it unless you need to calculate for a specific purpose. That formula would be general population X .0028 = # of skaters at Peak Load. Smallville has 837 core skaters. Some of them have jobs, or piano lessons, or intramural sports and won’t be out skating after school. (Only about 33% of them will.) So, 276 Smallville skaters can be expected to be out looking for a place to recreate in town during those most popular hours of the day. How much space does a skateboarder need? Once we know that, we’ll know how much total space all of the core skaters during peak times will need. We can simply multiply the needs of one skater by the total number of skaters. This will result in an amount of skatepark terrain that will accommodate all of the skaters during that most popular time to skate. The degree by which a need is being met within a community is commonly known as the “level of service.” Low level of service means that most of a community’s needs are being unmet. High level of service is desirable. In some areas the level of service can surpass the total needs of a community. For example, let’s say that a very wealthy and enthusiastic handball player moves into a small town and builds 25 handball courts. The community may only have a few handball players and, as a result of the millionaire’s generosity, far more handball courts than they could ever use. The level of service for handball in this town exceeds the need. There are very few towns in the United States that even come close to MEETING the need, much less surpassing it. The short answer is that each core skater needs 150 square feet. It should be noted that a single skateboarder can’t literally skate on only 150 square feet. (Imagine trying to skate in a 12’ by 12’ area.) The very smallest skateable space is 1,500 square feet. So the smallest skateable space can accommodate 10 skateboarders. The smallest space that can accommodate 11 skateboarders is 1,650 square feet, and 12 skateboarders would need 1,800 square feet, and so on. This number is what must be built to achieve 100% level of service for the service area. 100% of its needs are being met in terms of skateboarding facilities. You’ve taken all of the guesswork out of your service area’s needs. Now, when you approach the community and your public agencies with your vision for skateparks in your town, you have the numbers to back up your claims. In Smallville, our 276 skaters will need a total of 41,400 square feet. And we know the “vital stats” of Smallville. This is the end of the mathematical portion of the skatepark adoption model. From here you will use your intuition and instinct to give your skatepark adoption model character. You’ve learned everything you need to know about your community’s skatepark needs (at least for now). You’ve determined how much total skatepark your community needs. In this section you will refine that number by calculating what that looks like in terms of the number and type of skateparks. This is where your familiarity of your community will be very useful. If your service area has more than 50,000 people in it, you probably ended up with a large square footage number. That’s okay. Nobody is necessarily expecting you to approach the City and start talking about a skatepark that size. The skatepark adoption model result is the TOTAL amount of skatepark terrain that is needed. It doesn’t necessarily mean one giant skatepark. The largest skateparks in the United States rarely exceed 30,000 square feet. So any skatepark adoption model result larger than 30,000 square feet should probably be broken up into smaller parks and distributed evenly across the service area. The reason you should break up your result into smaller parcels is because your population cannot necessarily all get to one central spot on a regular basis. The idea for building public skateparks, of course, is so that people can use them as often as they like. Aside from ordinary requirements like school or work, the biggest obstacle to visiting the skatepark will be distance. A skatepark across town is not as easy to get to as a skatepark across the street, so the goal is to put a skatepark as close to where people live as possible. A skatepark on one side of town will be fantastic for skaters that live in that area, but it won’t work as well for skaters on the other side of town. A better solution would be to have two skateparks on either side of town. The larger your service area (both in terms of population and geographical size), the more skateparks strategically placed across the area you’ll need. Take a look at your skatepark adoption model recommendation. Consider how many neighborhood skateparks it comes out to. For every two neighborhood skateparks, include one skate spot to help link them. If you have more than 6 neighborhood skateparks, combine two of them to create a regional skatepark. You’ll need to adjust the number of neighborhood skateparks, skate spots, and regional skateparks until the total amount of footage equals the skatepark adoption model recommendation. This is not an exact science. Your goal is simply to create the most geographical coverage by distributing skate spaces around the service area. Adjustments and exceptions are the norm and you might find that a single regional skatepark is preferable to several neighborhood skateparks, for example. Don’t forget to subtract any current skateparks your service area may contain. Skateparks that don’t meet popular quality standards, such as wooden or steel ramps that are in such poor shape that they don’t attract users, can be left out. Smallville needs a total of 41,400 square feet of skatepark. Since a 41,000 square foot skatepark would be ridiculously large for a town this size, (it would be one of the biggest skateparks in the nation), we’ll break it up into parcels that will better serve the community. We’ll start with 3 neighborhood skateparks (10,000 sf each for a total of 30,000 sf) and 2 skate spots (5,000 sf each totaling 10,000 sf) for a total of 40,000 square feet. That’s reasonably close to the recommendation and we can always make adjustments later, if we need to. Now we have 3 neighborhood skateparks and 2 skate spots. 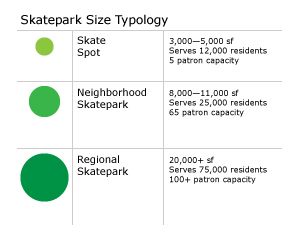 You know how much total skatepark your community needs, and you have an idea of what that looks like in terms of the number and relative sizes of those facilities. All that needs to happen now is to determine where they should generally go. Every neighborhood in your service area should have easy access to a skatepark. Since the neighborhood skatepark is the backbone of your skatepark system, the best place to start is by finding homes for those facilities. In this exercise it’s important to understand that you’re not finding specific sites for the skateparks. You should only be looking at locations in the general sense. Look at what neighborhoods within your community need a skatepark and don’t worry about if there’s a place within that area to literally put a skatepark, or what specific location it might be built at. Finding sites for your skatepark or skateparks is a very demanding exercise that has its own process and strategic approach. It helps to do this exercise while looking over a map of the service area. Even if you know your community well, a map can reveal information that you may not immediately consider. Between the neighborhood skateparks, find areas where the skate spots might be appropriate. The spots should be placed in areas that are more or less equally spaced between the neighborhood skateparks, or placed in small isolated areas where a neighborhood skatepark might be too large. The location of the regional skatepark, if your skatepark adoption model recommendation includes one, is less critical than the distribution of the smaller facilities. The regional park will draw from a large area, so its coverage area is less reliant on location. Look for characteristics in your service area that encourage and discourage access. Rivers, lakes, bluffs, highways, and industrial areas can all discourage access. A skatepark may be close “as the crow flies” but much farther by foot due to something in the way. When you’re assigning the neighborhood skateparks and skate spots, be sensitive to these obstacles. Conversely, there are some characteristics that can encourage access. Roads with bike lanes, schools, mixed retail districts (shops, restaurants, tourist attractions), and transit routes are places where the community comes together and are great areas for skateparks. In particular, you may have in your service area “boutique” retail districts with smaller stores without parking lots. These areas in particular are good for skateparks due to the high amount of pedestrian activity. Looking again at Smallville, we have three neighborhood skateparks and two skate spots to distribute. Our map shows four major shopping areas. One of them is newer and features a shopping mall and lots of “big-box” stores; it’s not very pedestrian-friendly. Another is near the local college, so that would be a good area for a skatepark. There are two strips of shopping that are dominated by fast-food drive-thru restaurants, car lots, and things like that. Only one of them has a nearby residential area, so that one is better than the other. There is also a high school and several elementary schools to keep in mind. In Smallville, we’ll start by making sure the college district has a skatepark. To the northeast is a residential area that is separated from the town by the freeway, so a skatepark on that side would provide service to those youth. Toward the south side of town there is a residential neighborhood, so our last neighborhood skatepark goes there. Our two skate spots are placed near two of the shopping areas and should provide some service to the few youth that live in those areas. It’s worth remembering that this result will bring your community to 100% level of service. Very few communities have the resources and desire to completely meet their skateboarders’ needs. It’s up to the local advocates to determine how much time and energy they want to put into pursuing this long-term goal. Most advocates set their sights on the first one or two facilities and leave the rest to future generations of skateboarders. You now have an informed vision for skateparks in your community that you can justify. When someone asks you, for example, how you came to that number, there’s a clear line of evidence based on market research, academic studies, and common sense that few people can refute.